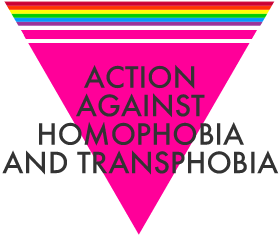 This is the official website for the Buckinghamshire Action Against Homophobia and Transphobia group. Here you can find out about how to report homophobic or transphobic abuse, see why you should report it, find some support, and also find out about us, what we do, why we do it and ways you can join. LGB people brought up in a homophobic society can often internalise these negative stereotypes and develop varying degrees of low self-esteem and self-hatred, often described as 'internalised homophobia'. Transphobia (by analogy with homophobia) refers to various kinds of aversions towards transsexuality and transsexual or transgendered people. It often takes the form of refusal to accept a person's new gender expression. Whether intentional or not, transphobia can have severe consequences for the targeted person; also, many transpeople experience homophobia as well, from people who associate gender identity disorder as a form of homosexuality. Direct forms of transphobia can manifest themselves in ways that are not related to violence. One example of this is the case of Tyra Hunter. Ms. Hunter was involved in an automobile accident, and when rescue workers discovered she was transgender, they backed away and stopped administering treatment. She later died in hospital. Two other well-noted transsexual victims were Brandon Teena and Gwen Araujo.